If you are going to design a room expressly for entertaining guests, adding a wet bar can be just what you need! A wet bar can help you focus the gathering point at a party and prevent spills and messes throughout the home. A sink, running water, and small refrigerator are common elements of a wet bar, and allow your guests to have their refreshments without adding clutter or traffic to your home kitchen. The easiest way to promote stability in your wet bar is to use a design other than a straight line. By adding at least one turn on in the bar surface, the cabinet space will have less tendency to tip or wobble. Another good idea is to build the cabinet at least 24 inches deep, as this will give you a larger, more stable footprint to support the counter area. Storing heavier party supplies down low and on the shorter sides of the bar will also provide more stability. If the bar does not have a cabinet space, adding a 6 inch wide foot pedestal will make the bar more stable without having to secure it directly to the flooring. 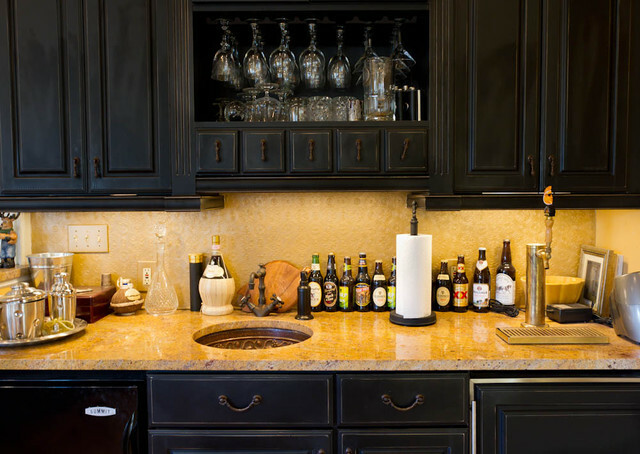 Plan for storage and convenience when designing your wet bar. Instead of the under-bar being an open space, a closed cabinet allows you to create a shelved storage area. You can even add locking doors to keep your wet bar secure when not in use, or when there are children in the area. Be creative with your cabinet design, and include a custom wine rack, keg cubby or even a below the bar sliding shelf to keep your glassware safe and accessible. The counter space of your wet bar should extend around 10 inches off the front and ends of the wet bar. This allows people standing at the bar room to move their feet, and gives plenty of legroom for those seated on bar stools. If the bar is designed for seating guests, you will probably want to add a foot rail or pedestal around the bottom of the bar to make seating more comfortable. On bars that have attached seating, placeholders can be inlaid in the bar top to contain condensation. The reason professional bars have a raised front edge is to prevent spills from staining the clothing of guests or making a mess on the floor. It is a good idea to raise the front edge at least a quarter inch. For even more protection and easier cleanup, build the bar with a slight tilt of a half inch or less so that spills flow toward the back of the bar. If you do that, install a stainless steel grating along the back edge, and spills can be swept right off the bar and into the gutter. Easy cleanup is also why commercial bars tend to have a heavy, slick finish. The faster cleanup can be, the more time the barkeeper will have for socializing with friends and relatives. The tips presented here are great starter ideas that can be included in any wet bar size or shape. You could even consider using plastic tubing for the water supply (and drains) and place your bar on casters to create a portable wet bar that can be used indoors or taken out to the patio or pool. The possibilities are endless for creating a wet bar that is uniquely your own! DFW Improved can help with both designing and installing your home wet bar area. You can request a free estimate here, or call us at 972-377-7600 today!